It’s time to ramp up our resistance to the Trump-Ryan agenda on health care. We scored our biggest legislative victory so far on March 24, when Speaker Paul Ryan called off his bid to repeal the Affordable Care Act (ACA), because he didn’t have the votes. This was an inspiring, hard-fought win for everyone who believes health care is for all. But Republican leaders in Congress are still gunning for our health care; their radical plans for our economy leave them no choice. Without gutting healthcare and other essential economic benefits, how else will they pay for the massive tax giveaway for corporations and billionaires that they’ve set their sights on? During Resistance Recess, now until April 23, as lawmakers visit their home districts, we will let them know we’re still fighting to make sure everyone in the country gets the care they need. Twenty thousand members of People’s Action, MoveOn.org, the Center for Popular Democracy, the Working Families Party and others gathered on a conference call April 9 to strategize with Reps. Maxine Waters, Barbara Lee and other progressive leaders. Is there strength in numbers? You bet. Why is this urgent? Last week, the Trump administration and House GOP leaders were scrambling to revive the health care repeal legislation by trading away protections for people with preexisting conditions to appease the far right. They didn’t get a vote on the bill before heading home for congressional recess, but we can be sure that gutting health care is still on their minds, and still a top priority. Proposals like block-granting Medicaid or privatizing Medicare aren’t just about pushing people off good, government-guaranteed health care into an uncertain market – though that’s certainly bad enough. These proposals are also designed to take resources from working and poor families in order to hand ever more wealth to corporations and the rich. The stalled Trump-Ryan health care repeal would have forced 24 million people off health care to make way for $600 billion in tax giveaways largely for corporations and the rich. If that tax break is huge, the tax reform giveaways that Donald Trump has proposed come in at a jaw-dropping $6 trillion – ten times the amount of the health repeal tax giveaway. So they’ll be looking for more places to cut, which is why health care will loom large in the upcoming showdowns over the federal budget and taxes, where food, housing, and the other essentials for survival will also be at stake. This will all play out in the upcoming tax and budget battles that will extend through the summer and beyond. The first round will come on April 28, when the continuing resolution that’s keeping the government funded in 2017 expires. Then Congress will turn to the fiscal year 2018 budget and hammering out the tax plan. And, to complicate matters, while the tax and budget fight is underway we need to stay alert for any attempts to pump life back into health repeal. There’s also the possibility that Congress and the administration will try to make their misinformation about ACA implosion come true by sabotaging the underpinnings of the system. One avenue would involve stopping payments to insurers that lower deductibles and other cost-sharing for 58 percent of those enrolled in ACA coverage. Refusing these payments would be a big blow to the 7.1 million people who receive the support, and it also could prompt insurers to withdraw from ACA markets. These details aside, the fight is clear. We can start guaranteeing an essential quality of life for all, or we can drive further inequality and corporate power. While your members of Congress are home for recess, tell them to stand on the right side of this choice. Protect our public health insurance programs, including Medicaid, Medicare, and the Children’s Health Insurance Program, from any cuts or changes that would mean less care or more expensive care. Instead of cutting these programs, we should expand them to begin to serve the real need. 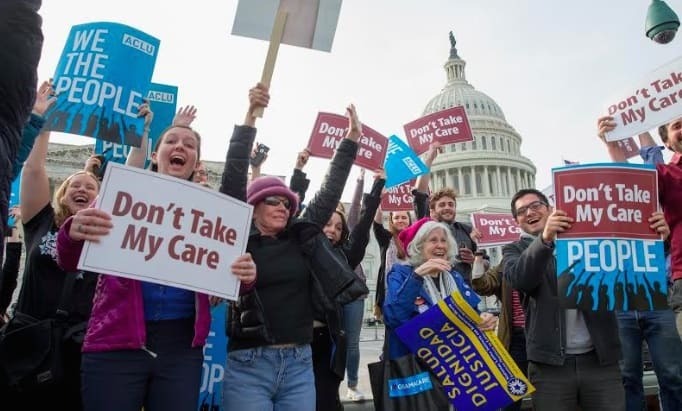 Reject any legislation that would penalize people for having a preexisting condition, cut essential health benefits such as prescription drugs, or let insurance corporations put caps on our care. Open public options for coverage in every state so insurance corporations like Anthem can’t hold us hostage, especially in rural and less-populated counties. Make our health care stronger by making it more affordable and less profit-driven. We can start by negotiating lower prices with drug corporations. Oppose any tax plan that would result in corporations, hedge funds, and the rich contributing less in taxes than they do now. Our economy is already too unequal. Support a budget that protects and expands the basic rights of people, families, and communities to thrive. This means ensuring that all people get the health care, food, housing, and other essentials that form the basis of just and democratic society. What can you do? Join our fight. Visit the Resistance Recess website to find an event in your area, or organize one of your own. We can win! We have one more chance this Independence Day to stop the GOP’s health care repeal before it sickens, bankrupts, and even kills many of us. Remember: grassroots pressure works. We need to increase pressure on lawmakers to make sure they move to "no" on the health care repeal and stay there, despite GOP efforts to delay and buy their votes in backroom deals. Colorado Senator Cory Gardner says the GOP "should be more open" about their plan to repeal health care. We agree. But Gardner's dismay doesn't take away his own responsibility to vote to defend health care in his state.